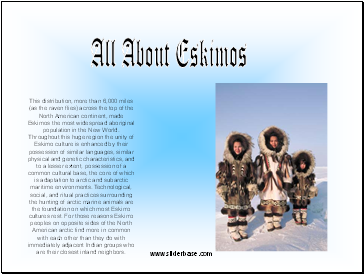 This is a good source of information for Eskimo ways of living and how they fed there families and how they lived Alaskan Eskimos are the most numerous and most diverse of all Eskimo populations. 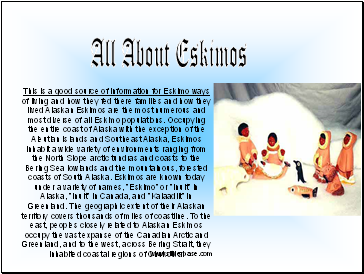 Occupying the entire coast of Alaska with the exception of the Aleutian Islands and Southeast Alaska, Eskimos inhabit a wide variety of environments ranging from the North Slope arctic tundras and coasts to the Bering Sea lowlands and the mountainous, forested coasts of South Alaska. 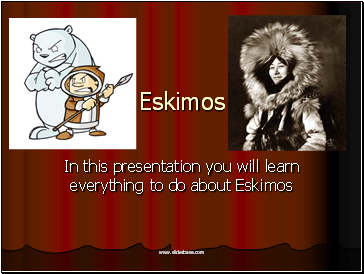 Eskimos are known today under a variety of names, "Eskimo" or "Inuit" in Alaska, "Inuit" in Canada, and "Kalaadlit" in Greenland. The geographic extent of their Alaskan territory covers thousands of miles of coastline. To the east, peoples closely related to Alaskan Eskimos occupy the vast expanse of the Canadian Arctic and Greenland, and to the west, across Bering Strait, they inhabited coastal regions of Chukotka. This distribution, more than 6,000 miles (as the raven flies) across the top of the North American continent, made Eskimos the most widespread aboriginal population in the New World. 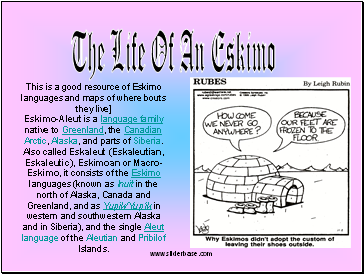 Eskimo-Aleut is a language family native to Greenland, the Canadian Arctic, Alaska, and parts of Siberia. 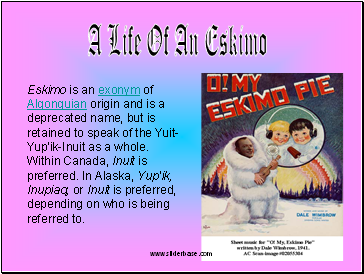 Also called Eskaleut (Eskaleutian, Eskaleutic), Eskimoan or Macro-Eskimo, it consists of the Eskimo languages (known as Inuit in the north of Alaska, Canada and Greenland, and as Yupik/Yup'ik in western and southwestern Alaska and in Siberia), and the single Aleut language of the Aleutian and Pribilof Islands.